Updated 3 p.m. | Posted 1:25 p.m.
Northeastern Minnesota's struggling moose population remains low, although the rate of decline has eased. That's the conclusion of state conservation officials after examining data from the Minnesota Department of Natural Resources aerial survey of moose in early January. Survey results indicate the number of moose rose to 4,020 in 2016 from an estimated 3,450 in 2015, a change that is statistically insignificant, the DNR said. Northeastern Minnesota's current moose population could be as high as 5,180 or as low as 3,230, the agency added. "Moose are not recovering in northeastern Minnesota," Glenn DelGiudice, moose project leader for the DNR, said in a statement. "It's encouraging to see that the decline in the population since 2012 has not been as steep, but longer term projections continue to indicate that our moose population decline will continue." 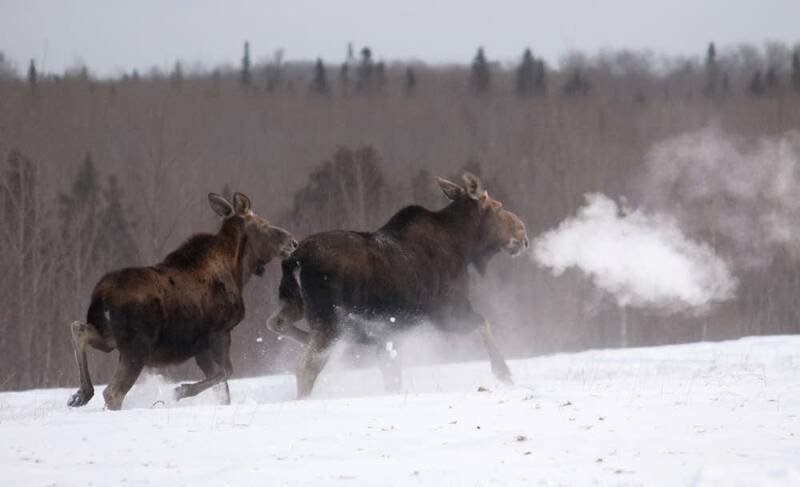 Annual population comparisons are made to 2006 because northeastern Minnesota's highest moose population estimate of 8,840 occurred that year. Since then, the moose population has declined 55 percent, the agency said. DNR research in the last three years shows about two-thirds of moose deaths are caused by health problems like parasites and infection. The other third were killed by wolves; but of those, about a quarter were already sick "and would most likely have tipped over anyway" if the wolves hadn't gotten them first, DelGuidice said. DelGiudice said more calves surviving beyond their first year also may be slowing the short-term population decline. Overall, DelGiudice said he was "cautiously optimistic" about the survey findings. The more scientists can learn about what's influencing moose survival and reproduction, the better chance land managers have to improve strategies that could enable moose to hang on, DelGuidice said. "I don't like to look at it as bleak," he added. "There's definitely hope."